Image: Baher Khairy on Unsplash, cropped by the Unsplash add-on in Google slides. Google Slides and I have spent a lot of time together, but our relationship is challenged every time I work with images. 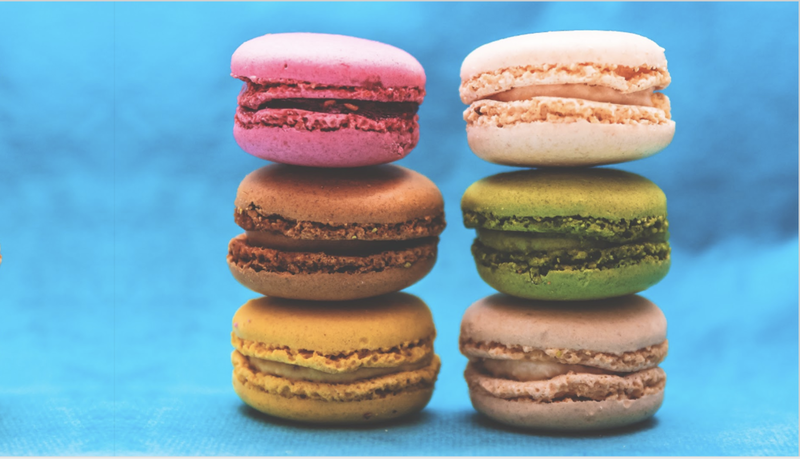 4:3 macarons image on a 16:9 slide. A black bar shows the difference between the rectangle shapes. Until yesterday, this was my workflow: I would open a second browser window and spend a ton of time searching for a good public domain image. I’d insert it into the slide. Then I’d spend a ton more time trying to make it fit. Repeat. The same macarons image, but it’s stretched to fill the slide. It looks mostly ok here — just flattish macarons — but not everything can be stretched. Same macarons image, mirrored. The join between the two images is visible on the left hand side. It’s hard to unsee once you see it. Most pictures that you find online have an aspect ratio of 4:3. In olden times (well, before 2013), slide decks used the same ratio. These days everything defaults to widescreen — 16:9 — instead, which is a problem if you like big splashy images that fill the full screen. And I do. I love big splashy images that fill the whole screen. They’re the best part of making slides. There are a bunch of ways to get around the difference in shapes. You can just accept that the image doesn’t fit and leave a blank space on the page, maybe matching the background colour if you’re feeling fancy. You can sometimes stretch the image without it being too terrible. You can do some wacky mirroring to cover up the empty space, though that can be annoying to get right. Or you can crop the image to the right aspect ratio. Did everyone know that Google Slides has add-ons? These are useful tools contributed by third parties to add extra functionality into Slides. I somehow didn’t notice the Add-ons menu until yesterday evening. The unsplash add-on open on a slide deck that’s just a bunch of unsplash images. The macarons image is the second to last slide. It’s full of wonders and I was delighted to discover an add-on for my favourite image library, unsplash.com. Unsplash has gorgeous pictures and this integration adds a neat sidebar to let you search them. Sure, you could do this in another browser tab, but it’s worth a lot to not have to download and upload the images. Even better, selecting an image crops the image to the shape of the slide. Amazing! If you don’t like the crop, you can get the original image back by right clicking and choosing "reset image". I was happy with all of the ones I’ve used though, and I’ve been playing with this thing a lot since I found it. I spend a ridiculous amount of my life on images. This is going to give me so much time back. By the way, not all of my images come from Unsplash and I’m still interested in better workflows for cropping images. If you’ve got a neat trick that you use, I would love to hear.